Antonio Laurino (2019). Amongst branding, design and architecture: a semiotic analysis of ING DIRECT’s bank shops. International Journal of Marketing Semiotics & Discourse Studies Vol. VII, pp.1-20. Submissions for Vol. VII are accepted from now and until the end of 2019 and will be published immediately upon acceptance based on our new all-year-round publishing policy. 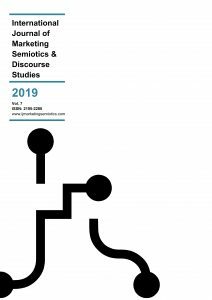 The International Journal of Marketing Semiotics & Discourse Studies welcomes both conceptual and applied academic research, but also provides a forum where marketing semiotics agencies may publicize case studies of projects they have undertaken for clients.